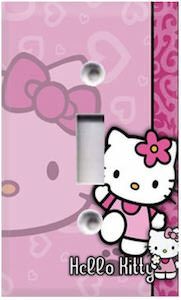 Now you can have a Hello Kitty Light Switch Plate to help with turning on the light. If you child love Hello Kitty or maybe even yourself and would like to make your room look a bit more fun then changing the light switch cover with this is a great way to add Hello Kitty to your room. The swtich plate is pink in color with hearts and the face of Hello Kitty in the background and then on top you can find Hello Kitty twice and her name. Changing this plate is easy and you don’t have to turn the power off just get a screwdriver and you are all set. Block out the sun with this Lots Of Letters Hello Kitty Car Sun Shade. If you really like Hello Kitty and want your car look amazing when parked then you just need this Hello Kitty car sun shade. The sun shade folds down so that you can easily store it like behind your seat or in the back. On the sun shade you can see lots of letters in the background and all are Hello Kitty related and you even find her head and bow on it and then on top of all that you can find a picture of Hello Kitty as if she is looking out of the window. The sun shade is made to block out all the sun from entering your front window keeping your car cooler while you are parked and then it will be ready for when you like to go for a drive. Now you can have fun with this Hello Kitty Cupcake Squishy. Squishy toys are popular with kids and adults and they are kind of like a stress toy only more fun. This time the squishy looks like a cupcake in pink and white and on top of the cupcake you can find the face of Hello Kitty. This Hello Kitty stress toy is for ages older than 3 years and will be great for adults too as you can really squish them too a really small size and they when you let it go it goes back to the normal shape. Hello Kitty fans will definitely want to add this to their clothing wardrobe, a super soft, super stylish plush hooded bath robe. This is an all light pink robe that has white polka dots all over it with the hood being the feature. Find an all white hood with ears, face and bow looking just like Hello Kitty. Made to be very soft from plush material with two front pockets as well as a pink polka dot tie string around the waist. The Hello Kitty hooded bath robe is available in a wide selection of sizes that go from Small to XL. If you Hello Kitty and summer are on your mind then you should check out this Hello Kitty sunglasses. These women’s sunglasses are available in many colors like white, black, pink, and more and on the sunglasses you can find a little red Hello Kitty bow and some of the whiskers to make it really look like Hello Kitty. And these fun sunglasses are UV400 and offer 100% UV protection. As the sun is not always out you want to protect your eye where and that is why they include a drawstring bag to protect your sunglasses. 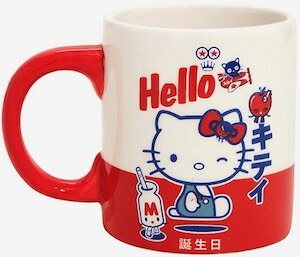 Now there is a fun red and white Hello Kitty mug that is just perfect for hot chocolate, coffee, and tea. The Hello Kitty mug has a red handle and lower half and the rest of the mug is white and then on top of the red and white you can find Hello Kitty and and some of his friends and you can also find some writing in a language I can’t understand. The mug is 11oz and made from ceramic and is not dishwasher or microwave safe. Just owning a fun Hello Kitty mug is so much better then just a plain boring mug so it would be perfect to have one. 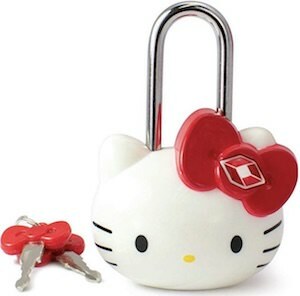 If you have an ID card and like Hello Kitty then you just have to check out this set Hello Kitty ID badge holders. The set includes 4 different badge holder all have a different Hello Kitty design and all look amazing. On the back of the badge holder it has a clip so that you can have it on your clothes or bag and there is a retractable system so that you never really have to unclip it. A bage holder like this is great for access badges, ski passes, keys and many other things. If you like a fun thing dangling on your car mirror then you should check out this super Hello Kitty air freshener. 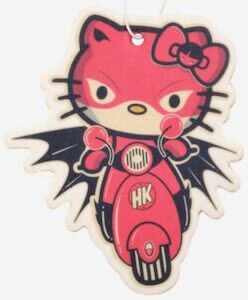 The air freshener smells like vanilla and looks like Hello Kitty as a superhero ridding a scooter. 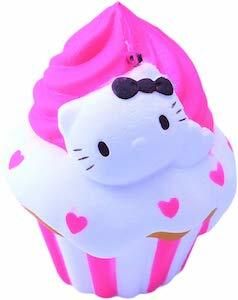 An air freshener like this is great for for all the Hello Kitty fans and besides having one in the car you can choose to have this one on different place like maybe in your garage, sports locker or anywhere else that it does not smells really fresh. And as Hello Kitty is dressed in red and black as a superhero this is great fun to have if you like superhero’s in general. If you want you child to eat their multi vitamins then you should check out these Hello Kitty kids vitamins. These gummy vitamins that looks like Hello Kitty and they looks fun and that will make kids really want them. 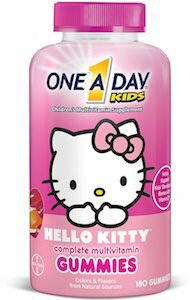 The Hello Kitty vitamins are made by One A Day and has a lot of important vitamins in it which will help your child to be healthy but of course this does not mean that they don’t have to eat healthy food anymore. Now anyone that like Hello Kitty and gummies should check out these fun multi vitamins as they will impress you.